In this post I will try to present some of them and to give some intuition what are possible applications for them. This article is focused more on the applications rather than on mathematical foundations. Moreover, it attempts to highlight that idea of Optics goes much, much further than manipulation of nested records. Optics are a group of purely functional abstractions to manipulate (get, set, modify, …) immutable objects. All illustratory code used in this article may be found in accompanying repo. If you are familiar with Lenses you can skip to other usages of Lenses. What are S and A? S represents the Product (or in other words “the whole part”, or container) and A some element inside of S (or in other words “the specific part”). It’s good to keep in mind that naming convention as it is omnipresent in Monocle and literature about Lenses. It will be used in the rest of the article. In a nutshell – by having get Lens allows to “zoom in” into a specific part of Product and by having set lets you construct new “whole part” with updated “specific part”. After zooming in we lose some information and that’s why setneeds S as an argument – to be able to reconstruct whole Product. Above code is everything you need to create Lens. Mind that not every pair of functions that was created with Lens.apply is a real Lens. Such pair must also obey Lens laws – same way as not every class with proper signature of flatMap method is a lawful Monad. For brevity I do not include those laws here, they can be found e.g. in scalaz tutorial. We will get back to them in section about testing. You may think: “So what? We can get and set case class values in some new way – what’s the point?”. The true benefit of Lenses lies in their composability. Full code for this example. As you can see the code is shorter and more readable. As Ilan noticed code size grows quadratically with straightforward approach and linearly with Lenses. Good thing about above classic example is that it made developers aware of Lenses. On the other hand it may have built an impression that Lenses, and Optics in general, are “just a thing that helps in accessing nested case classes”. However, the true power of Optics lies in the fact that there are more of them and they’re fully composable. But even with sole Lenses you can do much more than accessing nested records. You can use them for having “virtual fields”, maintaining invariants or accessing bit fields. In case of Lenses specialized in accessing case class fields, their code can be generated automatically most of the time. You can read about it in Monocle docs (scroll down to Lens Generation). where S represents the Sum (also known as Coproduct) and A is specific part of the Sum. Based on those definitions we may see that Prism is “Lens for trait hierarchies”. While it clearly does not drain the essence of Prism and we move beyond that, it gives you nice intuition to start with. It also explains why Prism’s getOptional (counterpart of Lens get) returns Option – that’s because “zooming in” to particular subtype may fail. That’s in lucid opposition to Lens get which may never fail – Product always contains all its parts. What does reverseGet reveal about nature of Prism? That is a counterpart of Lens set: A => S => S 1, but it does not have S as an argument. That is not needed because in case of Prism the specific case holds whole information needed to produce more general Sum. Prisms also can be generated for simple cases. You can read more about it in Monocle doc about Prism (scroll down to Prism generation). It’s not a lawful Prism but let’s ignore it for a while (we’ll get back to this in testing section). You may be surprised by PPrism – it will be described later. For now all you need to know is that stringToPercent type is exact equivalent of Prism[String, Percent]. Remember when I said that our prism was not lawful. This section will explain it more in detail. The former one is easy as compiler does the verification if signatures follow API. However, compiler is not able to verify if laws are obeyed. Therefore we need to take care of that by writing proper tests. To verify that created Prism follows Prism laws we will use monocle-law. That is additional artifact published as part of monocle project. It’s built on top of scalacheck and Typelevel’s discipline and contains definitions of all Optics laws. monocle-law uses property-based approach to testing. In this approach you define which properties should your code hold and then those properties are checked against randomly generated values. In case of testing Monocle’s Optics we will use Optics laws as assertions. Therefore we just need to take care of generating input values. It says that compiler requires implicit instance of Arbitrary and Equal for both A and S. Arbitrary[S] is responsible for generating possible values of S and Equal is scalaz’s typeclass for equality checking. For us more interesting is Arbitrary. Scalacheck has instances of Arbitrary for basic types and there are suitable defaults for Int and String. However, because instances of String generated by default generator are completely random we will create our own generator. Instead of completely randomized Strings would we would like to have mostly inputs similar to numeric values with some addition of different values. You may take a look at ArbitraryInstances to see how we define Arbitrary for String and Percent. Laws definitions similar to PrismTests exists to all Optics (e.g. Lens). As you saw testing against those laws is pretty straightforward and really helpful to spot unlawful behaviors early. 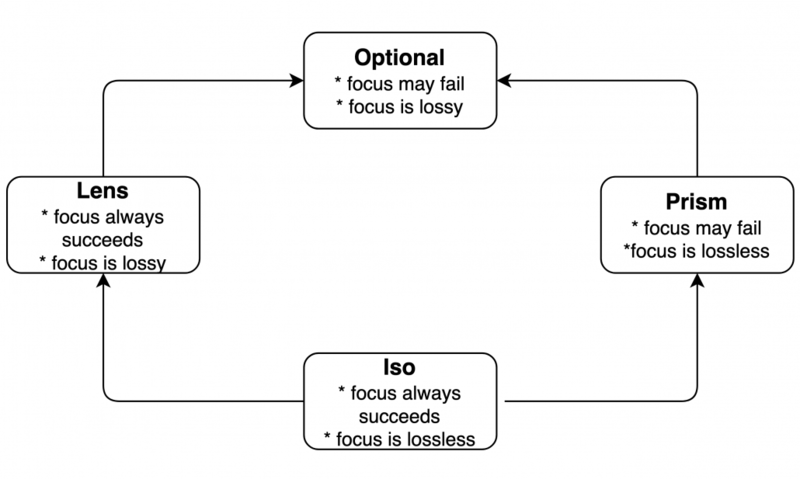 You can think of Iso as something that is simultaneously Lens and Prism. That means that navigating from S and A is always successful (as in Lens) and navigating from A to S does not need any additional information besides of A value (as in Prism) – in other words transformation from S to A is lossless. As you probably already concluded this corresponds nicely with mathematical concept of Isomorphism. Let’s consider Optional[Error, String], which would allow us to “zoom into” detailedMessage. It cannot be Lens[Error, String] as ErrorB does not contain detailMessage. That’s why we need Optional – it expliticly tells us that the operation may fail. It’s quite rare to see Optional implemented directly like above. Instead, usually you implement separate Prism and Lens and then compose them together. It will be discussed more in depth later. You can read more about Optional at Monocle docs. This diagram is meant to be read as UML class hierarchy diagram, so e.g. arrow going from Lens to Optional means that Lens is a special case of Optional. And what does it mean that both Lens and Prism can be treated as Optional? Lens is an Optional for which getOption always succeeds. Prism is an Optional for which we ignores S (“the whole part”) – A (“the specific part”) holds all information to produce new S.
This is not a full list of Optics. At Monocle docs you can see comprehensive diagram of relationships between all Optics. Composition of different types of Optics is what makes them especially appealing. It allows you to easily access and transform data between various representations. The beauty lies in fact that you need to define only a small portion of Optics – rest of them you can create by simply composing existing Optics. circe-optics is an excellent real-world application of Optics idea. When you think a while about traversing and modifying JSON documents it may struck you that there are quite a few aspects common with Optics. Field with given name may or may not exist – sounds like Prism, we may lossily focus into some field and the notion of nesting – sounds like Lens, then we need to “assume” that some field is e.g. String – sound like Prism again. Let’s take a very short look at circe-optics implementation. As we see it composes jsonObject Prism with index Optional. Our intuition says that it makes sense because before going deeper at desired field we need to “assume” with Prism that current field is a JSON object. The difference in simplicity and conciseness is striking. It was very rough introduction to internals of optics-circe. I encourage you to study source code – it’s really elegant solution to practical problem. Also codebase for optics is relatively small and contains nice tests. I owe you an explanation on PPrism. While toying around with Monocle you will quickly come across P-prefixed types like PPrism, POptional and PLens. In all those cases P stands for polymorphic. What is meant by some Optic being polymorphic? You may have noticed that all Lenses are pair of functions on types S and A. When Optic is polymorphic additional two types come into play for “reverse” operation: B for an argument and T for a result of that operation. The first two references were my main inspirations for this article. I recommend watching both of them to get the essence of Optics. If you find them interesting enough to dive even deeper, you should explore further references.